As part of the acclaimed HBO documentary series Empires that was screened on SBS within Australia, the latest edition of the saga returns to DVD that concentrates on the great Japanese empire between the 16th and 19th century. The series contains the original three episodes that run for a little over 160 minutes that takes viewers on amazing tour of this ancient culture that some of it is still practiced in Japan today. The first episode entitled The Way of the Samurai recounts the powerful warlike society of Japan that tells the tale of a young samurai boy who helps bring the country into a golden age for the next two centuries. Episode 2 entitled The Will of the Shogun focuses on the first official meeting between the West and how the powerful shoguns of Japan used their iron might over the peasants and newly formed Christians. The last episode entitled The Return of the Barbarians describes how Japan is finally reunited with the West after centuries of isolation from the rest of the world. Japan: Memoirs of a Secret Empire is also narrated by acclaimed actor and historian buff Richard Chamberlain who does a brilliant job at helping recount the tales and cultures of this ancient yet powerful civilisation. Chamberlain's voice is soothing and helps immerse viewers into this amazing series that actually makes you want to learn more about ancient Japan. The video quality of Japan: Memoirs of a Secret Empire is presented in its original aspect ratio of 1.78:1 (16x9 enhanced) that contains sharp pictures and images without any errors whatsoever. Considering that this is a relatively new documentary (2003), it is one of those DVD's that can be watched over and over again that is not only due to the compelling tales of ancient Japan but also the amazing picture quality. Japan: Memoirs of a Secret Empire is presented in Dolby Digital 2.0 stereo that is accompanied with a great musical score by Dave Iwatak and Dana Kaproff that is not only majestic but also helps tell the tale of the series. The audio is extremely clear and audible without any errors or lip-sync problems. 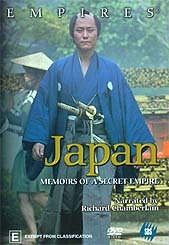 Documentary DVD's rarely contain any extras and Japan: Memoirs of a Secret Empire is no exception to the norm. Japan: Memoirs of a Secret Empire is very compelling documentary that I would highly recommend to all history buffs or for those that adore the Japanese empire. It's impossible to recount the entire Japanese history within 3 episodes but this series focuses on key points that makes it a very interesting and fascinating series.